Here we post signs of the impending apocalypse. George W. Bush-two terms in office. Scary thing is, he'd probably agree with you. Paramount, the studio behind a remake of the 1984 box-office smash Footloose, denies that the movie-musical is on hold in the wake of Zac Efron's withdrawal from the project. A spokesperson for the studio told EW that Footloose was "still moving forward" but would not comment on reports that Gossip Girl heartthrob Chace Crawford had tested for the lead as Efron's replacement, saying only that "casting is still in progress." Two separate sources tell EW that Chace Crawford did in fact meet with the project's director, Kenny Ortega, though it is unclear whether that meeting was an official "screen test." 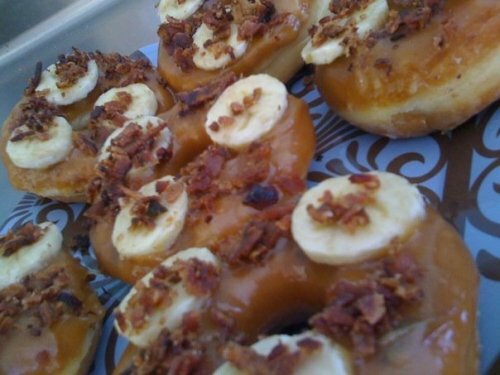 The Elvis donut is only the beginning. IT'S chocolate egg season again, and sales of the pagan and Christian symbols of rebirth are as strong as ever. But the hunt for Easter eggs may truly be on next year, because chocolate trees are in increasing trouble. Chocolate is made from the fermented, roasted seeds of the cacao tree. The cacao swollen shoot virus (CSSV) can kill the trees, and threatens to slash this year's spring crop by a third in the world's biggest producer, Ivory Coast. Meanwhile a fungus called witches' broom is doing the same in Brazil. Now researchers are racing to sequence the cacao genome and find genes that can resist CSSV. The return of craig johnston! All times are GMT -3. The time now is 10:49 PM.